Hello lovelies! So I don't know whether you can remember, but a couple of weeks ago I shared a berry smoothie bowl recipe (which you can read here) and you guys really seemed to like it! Since then I've been trying out so many different smoothie bowls and I thought I would show you one of my favourites so far. It's a green smoothie bowl, which I know sounds a bit daunting at first haha, but aside from the vibrant colour it tastes just as good as a normal one! 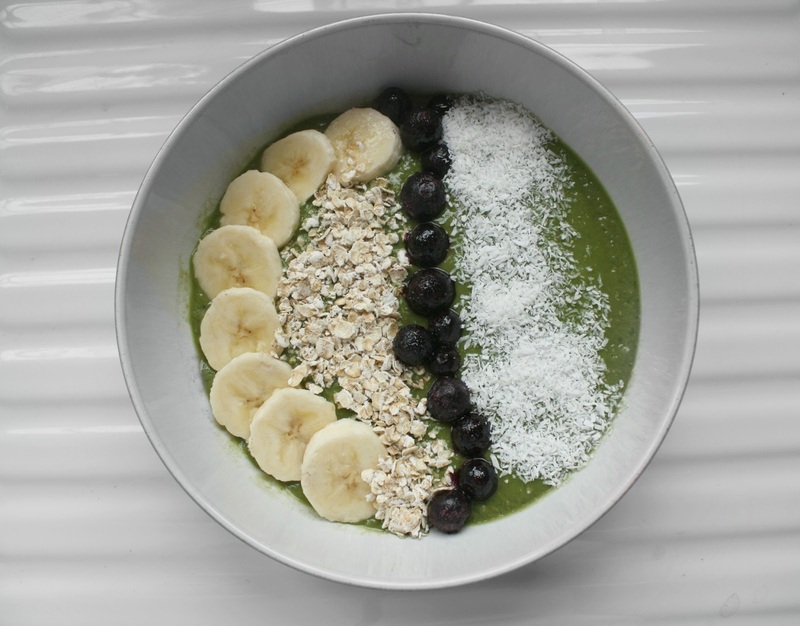 This breakfast bowl's main ingredients are the kale, spinach and kiwi in, to give it that bright green colour as well as lots of antioxidants, vitamins and iron which are perfect to start your day. I've been tweaking this recipe to my liking over the past few weeks, and do tell me if you try it! 01. Cut up and blend together all of the ingredients (except the berries and lime juice) until smooth and creamy. 02. Now, depending on how green you want your smoothie bowl to look, add some of the berries. The first few times I tried this recipe I added way too many and so the smoothie went a sludgy grey colour (not so great haha!) so be carefull to blend it little by little. Also add the lime juice in this step. 03. Then pour the vibrant green smoothie into a bowl and top with whatever you fancy. I went for banana, blueberries, oats and coconut which tasted delicious and looked pretty cute too! QOTD: IF YOU COULD LIVE ANYWHERE IN THE WORLD, WHERE WOULD YOU GO? I am in love with Bali and would love to live there, but I think I'd miss the big city! Hello Morgs! This recipe looks so delicious! I'm definitely going to try it! Also, I would love to live either in London, L.A or Tokyo! Oh my god this looks heavenly. Definitely making this! Thanks for sharing!! Love this great post, amazing pictures as well, thank you for the recipe, it looks very delicious!!! that looks so super yummy. i have to try it myself. <3333 everything looks so yummy! Looks so yummy! I want to try it now! !